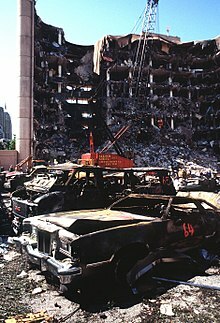 The Oklahoma City bombing was a domestic terrorist truck bombing on the Alfred P. Murrah Federal Building  in downtown Oklahoma City, Oklahoma, United States on April 19, 1995. Perpetrated by Timothy McVeigh and Terry Nichols, the bombing happened at 9:02 am and killed at least 168 people,  injured more than 680 others, and destroyed one-third of the building. The blast destroyed or damaged 324 other buildings within a 16-block radius, shattered glass in 258 nearby buildings, and destroyed or burned 86 cars,   causing an estimated $652 million worth of damage. Extensive rescue efforts were undertaken by local, state, federal, and worldwide agencies in the wake of the bombing, and substantial donations were received from across the country. The Federal Emergency Management Agency (FEMA) activated 11 of its Urban Search and Rescue Task Forces, consisting of 665 rescue workers who assisted in rescue and recovery operations. Until the September 11, 2001 attacks, the Oklahoma City bombing was the deadliest terrorist attack in the history of the United States, and remains the deadliest incident of domestic terrorism in the country's history. The official investigation, known as "OKBOMB", saw FBI agents conduct 28,000 interviews, amass 3.5 short tons (3,200 kg) of evidence, and collected nearly one billion pieces of information. The bombers were tried and convicted in 1997. McVeigh was executed by lethal injection on June 11, 2001, and Nichols was sentenced to life in prison in 2004. Michael and Lori Fortier testified against McVeigh and Nichols; Michael was sentenced to 12 years in prison for failing to warn the United States government, and Lori received immunity from prosecution in exchange for her testimony. As a result of the bombing, the U.S. Congress passed the Antiterrorism and Effective Death Penalty Act of 1996, which tightened the standards for habeas corpus in the United States,  as well as legislation designed to increase the protection around federal buildings to deter future terrorist attacks. On April 19, 2000, the Oklahoma City National Memorial was dedicated on the site of the Murrah Federal Building, commemorating the victims of the bombing. Remembrance services are held every year on April 19, at the time of the explosion. McVeigh and Nichols cited the federal government's actions against the Branch Davidian compound in the 1993 Waco siege (shown above) as a reason why they perpetrated the Oklahoma City bombing. In October 1994, McVeigh showed Michael Fortier and his wife, Lori, a diagram he had drawn of the bomb he wanted to build. McVeigh planned to construct a bomb containing more than 5,000 pounds (2,300 kg) of ammonium nitrate fertilizer, mixed with about 1,200 pounds (540 kg) of liquid nitromethane and 350 pounds (160 kg) of Tovex. Including the weight of the sixteen 55-U.S.-gallon drums in which the explosive mixture was to be packed, the bomb would have a combined weight of about 7,000 pounds (3,200 kg). McVeigh had originally intended to use hydrazine rocket fuel, but it proved to be too expensive. During the Chief Auto Parts Nationals National Hot Rod Association Drag Racing Championship Series event at the Texas Motorplex, McVeigh posed as a motorcycle racer and initially attempted to purchase 55-U.S.-gallon (46 imp gal; 210 L) drums of nitromethane on the pretense that he and some fellow bikers needed the fuel for racing, despite the lack of nitromethane-powered motorcycles at the meeting, and not having an NHRA competitors' license. Denied by one representative, Steve LeSueur, due to LeSueur's suspicions of McVeigh's actions and attitudes, he was then permitted to purchase three barrels from another representative, Tim Chambers. Chambers questioned the purchase of three barrels when typically only 1–5 gallons of nitromethane, he noted, would be purchased by a Top Fuel Harley rider, even though the class was not raced that weekend. LeSueur reported the incident to the FBI immediately after rejecting McVeigh's request. Think about the people as if they were storm troopers in Star Wars. They may be individually innocent, but they are guilty because they work for the Evil Empire. On April 14, 1995, McVeigh paid for a motel room at the Dreamland Motel in Junction City, Kansas. The following day he rented a 1993 Ford F-700 truck from Ryder under the name Robert D. Kling, an alias he adopted because he knew an Army soldier named Kling with whom he shared physical characteristics, and because it reminded him of the Klingon warriors of Star Trek. On April 16, 1995, he drove to Oklahoma City with fellow conspirator Terry Nichols where he parked a getaway car several blocks away from the Alfred P. Murrah Federal Building. The nearby Regency Towers Apartments' lobby security camera recorded images of Nichols's blue 1984 GMC pickup truck on April 16. After removing the license plate from the car, he left a note covering the Vehicle Identification Number (VIN) plate that read, "Not abandoned. Please do not tow. Will move by April 23. (Needs battery & cable)." Both men then returned to Kansas. McVeigh then added a dual-fuse ignition system accessible from the truck's front cab. He drilled two holes in the cab of the truck under the seat, while two holes were also drilled in the body of the truck. One green cannon fuse was run through each hole into the cab. These time-delayed fuses led from the cab through plastic fish-tank tubing conduit to two sets of non-electric blasting caps which would ignite around 350 pounds (160 kg) of high-grade explosives that McVeigh stole from a rock quarry. The tubing was painted yellow to blend in with the truck's livery, and duct-taped in place to the wall to make it harder to disable by yanking from the outside. The fuses were set up to initiate, through shock tubes, the 350 pounds (160 kg) of Tovex Blastrite Gel "sausages", which would in turn set off the configuration of barrels. Of the 13 filled barrels, nine contained ammonium nitrate and nitromethane, and four contained a mixture of the fertilizer and about 4 U.S. gallons (3.3 imp gal; 15 L) of diesel fuel. Additional materials and tools used for manufacturing the bomb were left in the truck to be destroyed in the blast. After finishing the truck bomb, the two men separated; Nichols returned home to Herington and McVeigh traveled with the truck to Junction City. FBI sketch (left) and McVeigh (right). 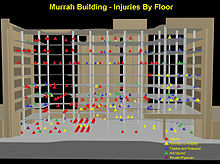 Floor-by-floor diagram detailing the location of the victims in the Alfred P. Murrah Federal Building. The Alfred P. Murrah Federal Building is demolished on May 23, 1995, over a month after the incident. The bomb was housed in a Ryder truck similar to the one visible in the lower left of the photograph. Rescue Team 5 remembers the victims who died in the bombing. The Federal Bureau of Investigation (FBI) led the official investigation, known as OKBOMB,  with Weldon L. Kennedy acting as Special Agent in charge. Kennedy oversaw 900 federal, state, and local law enforcement personnel including 300 FBI agents, 200 officers from the Oklahoma City Police Department, 125 members of the Oklahoma National Guard, and 55 officers from the Oklahoma Department of Public Safety. The crime task force was deemed the largest since the investigation into the assassination of John F. Kennedy. OKBOMB was the largest criminal case in America's history, with FBI agents conducting 28,000 interviews, amassing 3.5 short tons (3.2 t) of evidence, and collecting nearly one billion pieces of information. Federal judge Richard Paul Matsch ordered that the venue for the trial be moved from Oklahoma City to Denver, Colorado, citing that the defendants would be unable to receive a fair trial in Oklahoma. The investigation led to the separate trials and convictions of McVeigh, Nichols, and Fortier. The memorial includes a reflecting pool flanked by two large gates, one inscribed with the time 9:01, the other with 9:03, the pool representing the moment of the blast. On the south end of the memorial is a field of symbolic bronze and stone chairs – one for each person lost, arranged according to what floor of the building they were on. The chairs represent the empty chairs at the dinner tables of the victims' families. The seats of the children killed are smaller than those of the adults lost. On the opposite side is the "survivor tree", part of the building's original landscaping that survived the blast and fires that followed it. The memorial left part of the foundation of the building intact, allowing visitors to see the scale of the destruction. Part of the chain link fence put in place around the site of the blast, which had attracted over 800,000 personal items of commemoration later collected by the Oklahoma City Memorial Foundation, is now on the western edge of the memorial. North of the memorial is the Journal Record Building, which now houses the Oklahoma City National Memorial Museum, an affiliate of the National Park Service. The building also contains the National Memorial Institute for the Prevention of Terrorism, a law enforcement training center. Panoramic view of the memorial, as seen from the base of the reflecting pool. From left to right are the memorial chairs, Gate of Time and Reflecting Pool, the Survivor Tree, and the Journal Record Building. 2011 Oslo bombing, lone wolf attack against government offices, using similar explosives. ^ Ellis, Randy (March 18, 2018). "Dismissal of pharmacies from opioids abuse lawsuit upheld". NewsOK.com. Retrieved April 20, 2018. 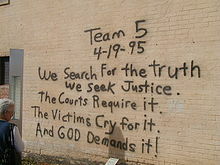 ^ a b "Victims of the Oklahoma City bombing". USA Today. Associated Press. June 20, 2001. Archived from the original on February 27, 2011. 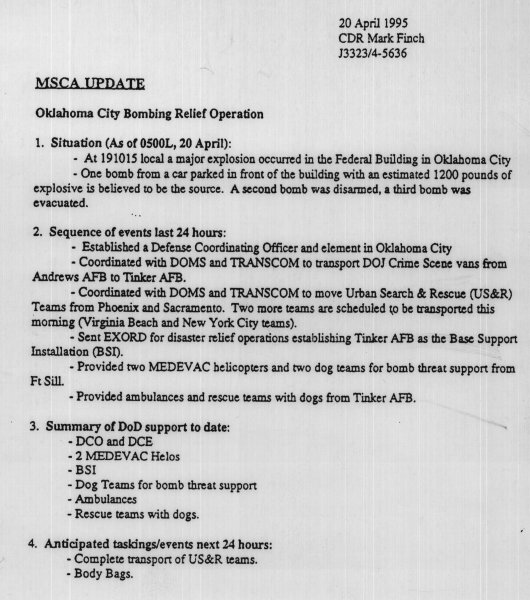 ^ a b c d e "Oklahoma City Police Department Alfred P. Murrah Federal Building Bombing After Action Report" (PDF). Terrorism Info. p. 58. Archived from the original (PDF) on July 3, 2007. ^ a b c "Case Study 30: Preventing glass from becoming a lethal weapon". Safety Solutions Online. Archived from the original on February 13, 2007. ^ Hewitt, Christopher (2003). Understanding Terrorism in America: from the Klan to al Qaeda. Routledge. p. 106. ISBN 978-0-415-27765-5. ^ a b c d e "Responding to Terrorism Victims: Oklahoma City and Beyond: Chapter II: The Immediate Crisis Response". U.S. Department of Justice. October 2000. Archived from the original on April 25, 2009. Retrieved March 24, 2009. ^ a b "FEMA Urban Search And Rescue (USAR) Summaries" (PDF). Federal Emergency Management Agency. p. 64. Archived from the original (PDF) on September 27, 2006. 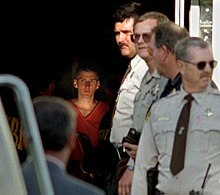 ^ a b "Timothy McVeigh is apprehended". NBC News Report. April 22, 1995. Archived from the original (Video, 3 minutes) on February 27, 2011. ^ a b Ottley, Ted (April 14, 2005). "License Tag Snag". truTV. Archived from the original on February 27, 2011. ^ a b Witkin, Gordon; Karen Roebuck (September 28, 1997). "Terrorist or Family Man? Terry Nichols goes on trial for the Oklahoma City bombing". U.S. News & World Report. Archived from the original on February 27, 2011. ^ a b Feldman, Paul (June 18, 1995). "Militia Groups Growing, Study Says Extremism: Despite negative publicity since Oklahoma bombing, membership has risen, Anti-Defamation League finds" (Fee required). Los Angeles Times. Retrieved April 7, 2010. ^ a b "McVeigh offers little remorse in letters". The Topeka Capital-Journal. Associated Press. June 10, 2001. Archived from the original on February 27, 2011. ^ a b c Serano, Richard. One of Ours: Timothy McVeigh and the Oklahoma City Bombing. pp. 139–141. ^ "Lessons learned, and not learned, 11 years later". MSNBC. Associated Press. April 16, 2006. Archived from the original on February 27, 2011. ^ a b Hamm, Mark S (1997). Apocalypse in Oklahoma. p. vii. ISBN 978-1-55553-300-7. ^ a b Doyle, Charles (June 3, 1996). "Antiterrorism and Effective Death Penalty Act of 1996: A Summary". FAS. Archived from the original on March 18, 2011. ^ Swickard, Joe (May 11, 1995). "The Life of Terry Nichols". The Seattle Times. Archived from the original on February 27, 2011. ^ "Bombing Trial". Online Focus. Public Broadcasting Service. May 13, 1997. Archived from the original on February 27, 2011. ^ Johnson, Kevin (April 16, 2010). "As Okla. City date nears, militias seen as gaining strength". USA Today. Archived from the original on February 27, 2011. ^ Means, Marianne (April 20, 1996). "Search for meaning produces scapegoats" (Fee required). The Tampa Tribune. Retrieved May 25, 2010. ^ Caesar, Ed (December 14, 2008). "The British Waco survivors". The Sunday Times. London. Archived from the original on February 27, 2011. ^ Baker, Al; Dave Eisenstadt; Paul Schwartzman; Karen Ball (April 22, 1995). "Revenge for Waco Strike Former Soldier is Charged in Okla. Bombing". Daily News. New York. Archived from the original on February 27, 2011. ^ a b c d e f g h i j k Collins, James; Patrick E. Cole; Elaine Shannon (April 28, 1997). "Oklahoma City: The Weight of Evidence". Time. pp. 1–8. Archived from the original on February 27, 2011. ^ a b "McVeigh's Apr. 26 Letter to Fox News". Fox News Channel. April 26, 2001. Archived from the original on February 27, 2011. ^ Russakoff, Dale; Serge F. Kovaleski (July 2, 1995). "An Ordinary Boy's Extraordinary Rage". The Washington Post. Archived from the original on February 27, 2011. ^ "McVeigh Considered Assassination of Reno, Other Officials". Fox News Channel. April 27, 2001. Archived from the original on March 18, 2011. ^ Michel, Lou; Dan Herbeck (2001). American Terrorist. Scientific American. 284. p. 224. Bibcode: 2001SciAm.284f..28D. doi: 10.1038/scientificamerican0601-28. ISBN 978-0-06-039407-3. ^ a b Michel, Lou; Dan Herbeck (2001). American Terrorist. Scientific American. 284. p. 167. Bibcode: 2001SciAm.284f..28D. doi: 10.1038/scientificamerican0601-28. ISBN 978-0-06-039407-3. ^ a b c Michel, Lou; Dan Herbeck (2001). American Terrorist. Scientific American. 284. pp. 168–169. Bibcode: 2001SciAm.284f..28D. doi: 10.1038/scientificamerican0601-28. ISBN 978-0-06-039407-3. ^ "White Supremacist Executed For Murdering 2 in Arkansas". The New York Times. April 21, 1995. Archived from the original on July 12, 2011. ^ a b Michel, Lou; Dan Herbeck (2001). American Terrorist. Scientific American. 284. p. 226. Bibcode: 2001SciAm.284f..28D. doi: 10.1038/scientificamerican0601-28. ISBN 978-0-06-039407-3. ^ Smith, Martin. "McVeigh Chronology". Frontline. Public Broadcasting Service. Archived from the original on February 27, 2011. ^ Scarpa Jr., Greg. "AP Report of Possible Subcommittee Inquiry into Oklahoma City Bombing, Recent Intelligence Concerning (a) Involvement of FBI Informant; and (b) Imminent Threat" (PDF). Forensic Intelligence International. Retrieved June 5, 2009. ^ a b c Ottley, Ted. "Imitating Turner". truTV. Archived from the original on February 27, 2011. ^ Michel, Lou; Dan Herbeck (2001). American Terrorist. Scientific American. 284. p. 201. Bibcode: 2001SciAm.284f..28D. doi: 10.1038/scientificamerican0601-28. ISBN 978-0-06-039407-3. ^ Michel, Lou; Dan Herbeck (2001). American Terrorist. Scientific American. 284. pp. 197–198. Bibcode: 2001SciAm.284f..28D. doi: 10.1038/scientificamerican0601-28. ISBN 978-0-06-039407-3. ^ "Evidence builds up against Nichols in trial". Boca Raton News. Associated Press. December 16, 1997. Retrieved June 29, 2009. ^ Thomas, Jo (November 20, 1997). "Bomb Suspect Hid Cash, Ex-Wife Testifies". The New York Times. Archived from the original on February 27, 2011. ^ a b c d Thomas, Jo (April 30, 1996). "For First Time, Woman Says McVeigh Told of Bomb Plan". The New York Times. Archived from the original on February 27, 2011. ^ Michel, Lou; Dan Herbeck (2001). American Terrorist. Scientific American. 284. pp. 163–164. Bibcode: 2001SciAm.284f..28D. doi: 10.1038/scientificamerican0601-28. ISBN 978-0-06-039407-3. ^ Florio, Gwen (May 6, 1997). "McVeigh's Sister Takes the Stand Against Him He Spoke of Moving From Antigovernment Talk to Action, She Testified, and of Transporting Explosives". The Philadelphia Inquirer. ^ Michel, Lou; Dan Herbeck (2001). American Terrorist. Scientific American. 284. p. 165. Bibcode: 2001SciAm.284f..28D. doi: 10.1038/scientificamerican0601-28. ISBN 978-0-06-039407-3. ^ a b Michel, Lou; Dan Herbeck (2001). American Terrorist. Scientific American. 284. p. 166. Bibcode: 2001SciAm.284f..28D. doi: 10.1038/scientificamerican0601-28. ISBN 978-0-06-039407-3. ^ a b Michel, Lou; Dan Herbeck (2001). American Terrorist. Scientific American. 284. p. 209. Bibcode: 2001SciAm.284f..28D. doi: 10.1038/scientificamerican0601-28. ISBN 978-0-06-039407-3. ^ Michel, Lou; Dan Herbeck (2001). American Terrorist. Scientific American. 284. p. 199. Bibcode: 2001SciAm.284f..28D. doi: 10.1038/scientificamerican0601-28. ISBN 978-0-06-039407-3. ^ Chronis, Peter. "Key a 'stroke of genius'". The Denver Post. Retrieved November 8, 2011. ^ Michel, Lou; Dan Herbeck (2001). American Terrorist. Scientific American. 284. p. 212. Bibcode: 2001SciAm.284f..28D. doi: 10.1038/scientificamerican0601-28. ISBN 978-0-06-039407-3. ^ Baldwin, Diana (December 13, 1998). "FBI Will Follow Up Bomb Case Forever". News OK.
^ Michel, Lou; Dan Herbeck (2001). American Terrorist. Scientific American. 284. pp. 206–208. Bibcode: 2001SciAm.284f..28D. doi: 10.1038/scientificamerican0601-28. ISBN 978-0-06-039407-3. ^ Michel, Lou; Dan Herbeck (2001). American Terrorist. Scientific American. 284. p. 215. Bibcode: 2001SciAm.284f..28D. doi: 10.1038/scientificamerican0601-28. ISBN 978-0-06-039407-3. ^ Michel, Lou; Dan Herbeck (2001). American Terrorist. Scientific American. 284. p. 216. Bibcode: 2001SciAm.284f..28D. doi: 10.1038/scientificamerican0601-28. ISBN 978-0-06-039407-3. ^ a b c d e f Michel, Lou; Dan Herbeck (2001). American Terrorist. Scientific American. 284. pp. 217–218. Bibcode: 2001SciAm.284f..28D. doi: 10.1038/scientificamerican0601-28. ISBN 978-0-06-039407-3. ^ Michel, Lou; Dan Herbeck (2001). American Terrorist. Scientific American. 284. p. 219. Bibcode: 2001SciAm.284f..28D. doi: 10.1038/scientificamerican0601-28. ISBN 978-0-06-039407-3. ^ a b Rogers, J. David; Keith D. Koper. "Some Practical Applications of Forensic Seismology" (PDF). Missouri University of Science and Technology. pp. 25–35. Retrieved June 5, 2009. ^ "McVeigh Held in Conjunction with Oklahoma City Bombing". mit.edu. ^ Michel, Lou; Dan Herbeck (2001). American Terrorist. Scientific American. 284. p. 220. Bibcode: 2001SciAm.284f..28D. doi: 10.1038/scientificamerican0601-28. ISBN 978-0-06-039407-3. ^ Michel, Lou; Dan Herbeck (2001). American Terrorist. Scientific American. 284. p. 228. Bibcode: 2001SciAm.284f..28D. doi: 10.1038/scientificamerican0601-28. ISBN 978-0-06-039407-3. ^ Michel, Lou; Dan Herbeck (2001). American Terrorist. Scientific American. 284. p. 229. Bibcode: 2001SciAm.284f..28D. doi: 10.1038/scientificamerican0601-28. ISBN 978-0-06-039407-3. ^ Tim, Talley (April 15, 2004). "Man testifies axle of truck fell from sky after Oklahoma City bombing". U-T San Diego. Archived from the original on February 27, 2011. ^ "A Study of the Oklahoma City Bombing". Homeland Security Television. 2006. 10:42 minutes in. ^ Irving, Clive (1995). In Their Name. p. 76. ISBN 978-0-679-44825-9. ^ a b c d e f "The Oklahoma Department of Civil Emergency Management After Action Report" (PDF). Department of Central Services Central Printing Division. 1996. p. 77. Retrieved June 26, 2009. ^ City of Oklahoma City Document Management (1996). Final Report. pp. 10–12. ISBN 978-0-87939-130-0. ^ Irving, Clive (1995). In Their Name. p. 52. ISBN 978-0-679-44825-9. ^ a b "Responding to Terrorism Victims: Oklahoma City and Beyond: Chapter I, Bombing of the Alfred P. Murrah Federal Building". U.S. Department of Justice. October 2000. Archived from the original on February 27, 2011. ^ Hewitt, Christopher (2003). Understanding Terrorism in America. p. 106. ISBN 978-0-415-27766-2. ^ Mlakar, Sr., Paul F.; W. Gene Corley; Mete A. Sozen; Charles H. Thornton (August 1998). 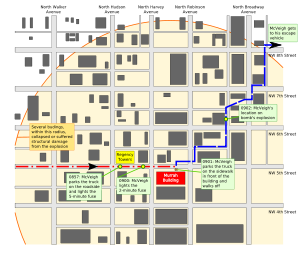 "The Oklahoma City Bombing: Analysis of Blast Damage to the Murrah Building". Journal of Performance of Constructed Facilities. 12 (3): 113–119. doi: 10.1061/(ASCE)0887-3828(1998)12:3(113). ^ Holzer, T. L.; Joe B. Fletcher; Gary S. Fuis; Trond Ryberg; Thomas M. Brocher; Christopher M. Dietel (1996). "Seismograms Offer Insight into Oklahoma City Bombing". American Geophysical Union. 77 (41): 393, 396–397. Bibcode: 1996EOSTr..77..393H. doi: 10.1029/96EO00269. Archived from the original on November 13, 2007. ^ a b Hamm, Mark S (1997). Apocalypse in Oklahoma. pp. 62–63. ISBN 978-1-55553-300-7. 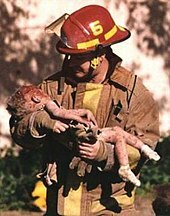 ^ "Library Factfiles: The Oklahoma City Bombing". The Indianapolis Star. August 9, 2004. Archived from the original on February 27, 2011. ^ Crogan, Jim (March 24, 2004). "Secrets of Timothy McVeigh". LA Weekly. Archived from the original on February 27, 2011. ^ a b Zucchino, David (May 14, 1995). "Tracing a Trail to Destruction; The Clues from the Oklahoma City Bombing Have Led to; A Small Circle of Malcontents – Not a Wide Network" (Fee required). The Philadelphia Inquirer. Retrieved June 14, 2009. ^ Morava, Kim (February 24, 2009). "Trooper who arrested Timothy McVeigh shares story". Shawnee News-Star. Archived from the original on February 27, 2011. ^ a b "Turning to evidence: axle and fingerprints". Kingman Daily Miner. Associated Press. April 21, 1997. Retrieved June 27, 2009. ^ Hamm, Mark S (1997). Apocalypse in Oklahoma. p. 65. ISBN 978-1-55553-300-7. ^ a b Ottley, Ted (April 14, 2005). "Innocence Lost". truTV. Archived from the original on February 27, 2011. ^ Michel, Lou; Dan Herbeck (2001). American Terrorist. Scientific American. 284. p. 270. Bibcode: 2001SciAm.284f..28D. doi: 10.1038/scientificamerican0601-28. ISBN 978-0-06-039407-3. ^ "A Study of the Oklahoma City Bombing". Homeland Security Television. 2006. 11:07 minutes in. ^ Michel, Lou; Dan Herbeck (2001). American Terrorist. Scientific American. 284. p. 274. Bibcode: 2001SciAm.284f..28D. doi: 10.1038/scientificamerican0601-28. ISBN 978-0-06-039407-3. ^ "The Oklahoma City Bombing Case: The Second Trial". CourtTV News. Archived from the original on February 13, 2008. ^ "Michael Moore didn't libel bomber's brother, court says". USA Today. Associated Press. February 20, 2007. Archived from the original on February 27, 2011. ^ Michel, Lou; Susan Schulman (April 29, 1995). "McVeigh Tried to Have Ammo Mailed His Sister Picked Up Supply After Store Refused His Request to Ship It" (Fee required). The Buffalo News. Retrieved April 7, 2010. ^ Church, George J.; Patrick E. Cole (August 14, 1995). "The Matter of Tim McVeigh". Time. p. 2. Archived from the original on February 27, 2011. ^ Fuchs, Penny Bender (June 1995). "Jumping to Conclusions in Oklahoma City?". American Journalism Review. Archived from the original on February 27, 2011. ^ Hamm, Mark S (1997). Apocalypse in Oklahoma. p. 63. ISBN 978-1-55553-300-7. ^ Figley, Charles R (2002). treating Compassion Fatigue. p. 61. ISBN 978-1-58391-053-5. ^ a b c d "April 19, 1995". World News Tonight With Peter Jennings. Season 31. April 19, 1995. ABC. ^ a b c Thomas, Jo (May 23, 1997). "McVeigh Defense Team Suggests Real Bomber Was Killed in Blast". The New York Times. Archived from the original on February 27, 2011. ^ a b Miller, Richard Earl (2018). "Writing at the End of the World". Nature. 555 (7695): 100. Bibcode: 2018Natur.555..280Y. doi: 10.1038/d41586-018-02750-3. ^ United States Department of Defense (January 25, 2005). "Design of Buildings to Resist Progressive Collapse" (PDF). General Services Administration. p. 14. Archived from the original (PDF) on December 24, 2013. Retrieved June 5, 2009. ^ a b c Mallonee, Sue; Sheryll Shariat; Gail Stennies; Rick Waxweiler; David Hogan; Fred Jordan (1996). "Physical Injuries and Fatalities Resulting From the Oklahoma City Bombing" (PDF). Journal of the American Medical Association. 276 (5): 382–387. doi: 10.1001/jama.276.5.382. PMID 8683816. ^ a b Michel, Lou; Dan Herbeck (2001). American Terrorist. Scientific American. 284. p. 234. Bibcode: 2001SciAm.284f..28D. doi: 10.1038/scientificamerican0601-28. ISBN 978-0-06-039407-3. ^ (subscription required) Chris Casteel (April 29, 2015). "Oklahoma U.S. Rep. Steve Russell seeks Purple Hearts for six Oklahoma City bombing victims". The Oklahoman. ^ Romano, Lois (December 30, 1997). "Prosecutors Seek Death For Nichols". The Washington Post. p. A3. Archived from the original on February 27, 2011. ^ Irving, Clive (1995). In Their Name. p. 82. ISBN 978-0-679-44825-9. ^ Irving, Clive (1995). In Their Name. pp. 96–97. ISBN 978-0-679-44825-9. ^ Hamm, Mark S (1997). Apocalypse in Oklahoma. p. 73. ISBN 978-1-55553-300-7. ^ Michel, Lou; Dan Herbeck (2001). American Terrorist. Scientific American. 284. p. 225. Bibcode: 2001SciAm.284f..28D. doi: 10.1038/scientificamerican0601-28. ISBN 978-0-06-039407-3. ^ a b Eddy, Mark. "April 19, 1995". The Denver Post. Archived from the original on February 27, 2011. ^ a b c Winthrop, Jim (July 1997). "The Oklahoma City Bombing: Immediate Response Authority and Other Military Assistance to Civil Authority (MACA)". The Army Lawyer. Archived from the original on February 27, 2011. ^ a b c Davis, G (1995). "Victims by the Hundreds: EMS Response and Command". Fire Engineering. 148 (10): 98–107. Retrieved November 17, 2012. ^ Giordano, Geraldine (December 15, 2002). The Oklahoma City Bombing. p. 36. ISBN 978-0-8239-3655-7. ^ Irving, Clive (1995). In Their Name. p. 68. ISBN 978-0-679-44825-9. ^ Ottley, Ted (April 14, 2005). "The Oklahoma City Bombing: Bad Day Dawning". truTV. Archived from the original on February 27, 2011. ^ Irving, Clive (1995). In Their Name. p. 78. ISBN 978-0-679-44825-9. ^ Figley, Charles R (2002). Treating Compassion Fatigue. p. 62. ISBN 978-1-58391-053-5. ^ Irving, Clive (1995). In Their Name. p. 103. ISBN 978-0-679-44825-9. ^ Giordano, Geraldine (December 15, 2002). The Oklahoma City Bombing. p. 34. ISBN 978-0-8239-3655-7. ^ Irving, Clive (1995). In Their Name. p. 86. ISBN 978-0-679-44825-9. ^ a b Linenthal, Edward (2003). The Unfinished Bombing: Oklahoma City in American Memory. p. 140. ISBN 978-0-19-516107-6. ^ Stickney, Brandom M (1996). All-American Monster. p. 234. ISBN 978-1-57392-088-9. ^ Candiotti, Susan (May 23, 1995). "Federal Building Demolition". CNN. Archived from the original on March 8, 2008. ^ Linenthal, Edward (2003). The Unfinished Bombing: Oklahoma City in American Memory. pp. 142–144. ISBN 978-0-19-516107-6. ^ Linenthal, Edward. The Unfinished Bombing: Oklahoma City in American Memory. p. 47. ISBN 978-0-19-516107-6. ^ "$10 million collected for bombing victims". The Pantagraph. Associated Press. June 5, 1995. ^ Hamm, Mark S (1997). Apocalypse in Oklahoma. p. 60. ISBN 978-1-55553-300-7. ^ "San Diego Blood Bank History". San Diego Blood Bank. Archived from the original on February 27, 2011. ^ Heinrich, Janet (September 10, 2002). "Maintaining an Adequate Blood Supply Is Key to Emergency Preparedness" (PDF). Government Accountability Office. Retrieved September 25, 2011. ^ Hamm, Mark S (1997). Apocalypse in Oklahoma. p. 46. ISBN 978-1-55553-300-7. ^ a b c Hamm, Mark S (1997). Apocalypse in Oklahoma. pp. 57–58. ISBN 978-1-55553-300-7. ^ Hamm, Mark S (1997). Apocalypse in Oklahoma. p. 71. ISBN 978-1-55553-300-7. ^ Keating, Frank (August 31, 1999). "Where Terrorists Belong". The New York Times. Archived from the original on February 27, 2011. ^ Witt, Howard (April 17, 2005). "Torment lingers in OK City". Chicago Tribune. Archived from the original on February 27, 2011. ^ "Meet Our President/CEO". Goodwill Industries. Archived from the original on April 26, 2007. ^ a b c "Friend, Foe United in Vilifying Attack Reaction: Compassion for victims' families, disgust at blast's callousness run as common threads through world leaders' responses" (Fee required). Los Angeles Times. April 21, 1995. Retrieved April 7, 2010. ^ a b "'How Deeply We Share the Sorrow' Rabin Also Offers Help; Boutros-Ghali Condemns 'Cowardly Attack'". St. Louis Post-Dispatch. April 20, 1995. ^ "A Mother's Pain For Ever Frozen in Time". The Star. Associated Press. April 19, 2005. ^ a b "FBI: McVeigh knew children would be killed in OKC blast". CNN. March 29, 2001. Archived from the original on February 27, 2011. ^ Schoenburg, Bernard. "McVeigh prosecutor: Focus on victims of Oklahoma City bombing". The State Journal-Register. Archived from the original on February 27, 2011. ^ Sturken, Marita (November 2007). Tourists of History. p. 98. ISBN 978-0-8223-4122-2. ^ "1996 Pulitzer Prizes-Spot News Photography". Pulitzer Prize. Archived from the original on February 27, 2011. ^ West, Lance (March 22, 2017). ""It's still tough to talk about," Firefighter from iconic Oklahoma City bombing photo retires". News Channel 4. Retrieved March 22, 2017. ^ Pfefferbaum, Betty (April 23, 2009). "The impact of the Oklahoma City bombing on children in the community" (Fee required). Military Medicine. 166 (12): 49. ^ Pfefferbaum, Betty; Sconzo, Guy M.; Flynn, Brian W.; Kearns, Lauri J.; Doughty, Debby E.; Gurwitch, Robin H.; Nixon, Sara Jo; Nawaz, Shajitha (2003). "Case Finding and Mental Health Services for Children in the Aftermath of the Oklahoma City Bombing". Journal of Behavioral Health Services & Research. 30 (2): 215–227. doi: 10.1097/00075484-200304000-00006. Retrieved November 27, 2012. ^ Leland, John (April 22, 1996). "The orphans of Oklahoma City". Newsweek. 127 (17): 40. Retrieved November 27, 2012. ^ Hamm, Mark S (1997). Apocalypse in Oklahoma. p. 54. ISBN 978-1-55553-300-7. ^ a b Loe, Victoria (July 5, 1997). "Berlin-Based Team's Design Chosen for Bomb Memorial; Winning Entry Evokes Images of Reflection, Hope" (Fee required). The Dallas Morning News. Retrieved June 5, 2009. ^ Martin, Gary (April 24, 1995). "President demands execution for bombers" (Fee required). San Antonio Express-News. Retrieved June 27, 2009. ^ Thomma, Steven (April 23, 1995). "With his swift response, Clinton grabs center stage" (Fee required). Philadelphia Inquirer. Retrieved June 27, 2009. ^ Michel, Lou; Dan Herbeck (2001). American Terrorist. Scientific American. 284. p. 249. Bibcode: 2001SciAm.284f..28D. doi: 10.1038/scientificamerican0601-28. ISBN 978-0-06-039407-3. ^ Kellner, Douglas (January 1, 2008). Guys and Guns Amok. p. 102. ISBN 978-1-59451-493-7. ^ Hamm, Mark S (1997). Apocalypse in Oklahoma. p. 55. ISBN 978-1-55553-300-7. ^ Progler, J.A. "The Utility of Islamic Imagery in the West". Al-Tawhid. 14 (4). Retrieved June 5, 2009. ^ Johnson, David (April 20, 1995). "At Least 31 Are Dead, Scores Are Missing After Car Bomb Attack in Oklahoma City Wrecks 9-Story Federal Building". The New York Times. p. 1. Retrieved November 10, 2012. ^ Miller, Kyle. "United We Stood" (PDF). pp. 1–19. Retrieved November 10, 2012. ^ Paul. "Common Stereotypes". p. 1. Retrieved December 5, 2012. ^ Fuchs, Penny. "Jumping to Conclusions in Oklahoma City?". pp. 1–2. Retrieved November 10, 2012. ^ Kifner, John (July 18, 1995). "June 11–17: John Doe No. 2; A Dragnet Leads Down One More Blind Alley". The New York Times. Archived from the original on February 27, 2011. ^ Vidal, Gore (September 2001). "The Meaning of Timothy McVeigh". Vanity Fair. Archived from the original on March 18, 2011. ^ Gibbons, Fiachra (August 17, 2001). "Vidal Praises Oklahoma Bomber for Heroic Aims". The Guardian. London. Archived from the original on March 18, 2011. ^ "Statement of Special Agent in Charge Danny Defenbaugh Regarding OKBOMB Documents" (Press release). FBI. May 11, 2001. Archived from the original on February 27, 2011. ^ Ostrow, Ronald (August 9, 1995). "Chief of Oklahoma Bomb Probe Named Deputy Director at FBI" (Fee required). Los Angeles Times. Retrieved February 27, 2011. ^ a b Hamm, Mark S (1997). Apocalypse in Oklahoma. p. 76. ISBN 978-1-55553-300-7. ^ "Lessons learned, and not learned, 11 years later". MSNBC. Associated Press. April 16, 2006. Retrieved March 25, 2009. ^ "Bombing trial moves to Denver". Gainesville Sun. Associated Press. February 21, 1996. Retrieved June 5, 2009. ^ Wright, Stuart. Patriots, Politics, and the Oklahoma City Bombing. p. 10. ISBN 978-0-521-69419-3. ^ a b c d e f g h Linder, Douglas O. (2006). "The Oklahoma City Bombing & The Trial of Timothy McVeigh". Famous Trials: Oklahoma City Bombing Trial. University of Missouri–Kansas City. Archived from the original on February 27, 2011. ^ "Petition for Writ of Mandamus of Petitioner-Defendant, Timothy James McVeigh and Brief in Support". Case No. 96-CR-68-M. United States Court of Appeals for the Tenth Circuit. March 25, 1997. Archived from the original on February 27, 2011. ^ Michel, Lou; Dan Herbeck (2001). American Terrorist. Scientific American. 284. pp. 285–286. Bibcode: 2001SciAm.284f..28D. doi: 10.1038/scientificamerican0601-28. ISBN 978-0-06-039407-3. ^ Johnston, David (August 31, 1995). "Leg in the Oklahoma City Rubble Was That of a Black Woman". The New York Times. Archived from the original on February 27, 2011. ^ Michel, Lou; Dan Herbeck (2001). American Terrorist. Scientific American. 284. pp. 315–317. Bibcode: 2001SciAm.284f..28D. doi: 10.1038/scientificamerican0601-28. ISBN 978-0-06-039407-3. ^ "U.S. v. McVeigh". Oklahoma State Courts Network. Archived from the original on March 18, 2011. ^ Eddy, Mark; George Lane; Howard Pankratz; Steven Wilmsen (July 3, 1997). "Guilty on Every Count". The Denver Post. Archived from the original on March 18, 2011. ^ Pellegrini, Frank. "McVeigh Given Death Penalty". Time. Archived from the original on March 18, 2011. ^ Bierbauer, Charles; Susan Candiotti; Gina London; Terry Frieden (May 11, 2001). "McVeigh execution rescheduled for June 11". CNN. Archived from the original on March 18, 2011. ^ "Judge Won't Delay McVeigh Execution". The Washington Post. Associated Press. June 6, 2001. Archived from the original on March 18, 2011. ^ Mears, Bill (July 28, 2008). "Bush approves execution of Army private". CNN. Archived from the original on March 18, 2011. ^ "McVeigh Execution: A "completion of justice"". CNN. June 11, 2001. Archived from the original on March 18, 2011. ^ "Day of Reckoning (execution of Timothy McVeigh)". NBC News Report. June 11, 2001. Archived from the original (Video) on March 18, 2011. ^ Frieden, Terry (April 12, 2001). "Okla. families can watch McVeigh execution on TV". CNN. Archived from the original on March 18, 2011. ^ Wright, Stuart. Patriots, Politics, and the Oklahoma City Bombing. p. 17. ISBN 978-0-521-69419-3. ^ Thomas, Jo (December 28, 1997). "December 21–27; Nichols Found Guilty in Oklahoma City Case". The New York Times. Archived from the original on March 18, 2011. ^ Davey, Monica (May 27, 2004). "Nichols found guilty of murder". San Francisco Chronicle. Archived from the original on March 18, 2011. ^ Talley, Tim (August 10, 2004). "Nichols gets 161 life sentences". The Register-Guard. Retrieved June 11, 2009. ^ "FBI: Explosives Found in Nichols' Old Home". Fox News Channel. Associated Press. April 2, 2005. Archived from the original on March 18, 2011. ^ Jo, Thomas (March 29, 2001). "'No Sympathy' for Dead Children, McVeigh Says". The New York Times. Archived from the original on March 18, 2011. ^ Ottley, Ted (June 11, 2001). "McVeigh in Good Spirits in Final Hours, June 11, 2001". truTV. Archived from the original on March 18, 2011. ^ Talley, Tim (April 17, 2006). "Experts fear Oklahoma City bombing lessons forgotten". U-T San Diego. Archived from the original on February 27, 2011. ^ Blejwas, Andrew; Anthony Griggs; Mark Potok (Summer 2005). "Almost 60 Terrorist Plots Uncovered in the U.S.: Terror From the Right". Southern Poverty Law Center. Archived from the original on February 27, 2011. ^ MacQuarrie, Brian (April 19, 2005). "Militias' era all but over, analysts say". Boston Globe. Archived from the original on March 18, 2011. ^ "The Enemy Within". BBC News. June 7, 2001. Archived from the original on March 18, 2011. ^ Cassell, Paul (1999). "Barbarians at the Gates? A Reply to the Critics of the Victims' Rights Amendment". Utah Law Review. 479. ^ a b Condon, Patrick (June 12, 2004). "Bomb ingredient restricted in 2 states". Boston Globe. Archived from the original on March 18, 2011. ^ Gray, Jerry (June 6, 1995). "Senate Votes to Aid Tracing of Explosives". The New York Times. Archived from the original on March 18, 2011. ^ "Company Creates Hard-to-Ignite Fertilizer to Foil Bomb-Makers". Fox News Channel. Associated Press. September 23, 2008. Archived from the original on March 18, 2011. ^ "Honeywell Sulf-N® 26: A New Fertilizer for a New World" (PDF). HoneyWell. Archived from the original (PDF) on December 9, 2013. Retrieved May 11, 2016. ^ Alex Cameron (March 30, 2010). "15 Years Later: Time To Teach Students The Murrah Bombing?". NewsOn6. Retrieved December 10, 2012. ^ Ed Vulliamy (April 11, 2010). "Oklahoma: the day homegrown terror hit America". The Guardian. London. Retrieved December 10, 2012. ^ Jennifer Pierce (April 6, 2010). "Governor Henry Signs Bill Making Murrah Bombing Required Learning". News9. Retrieved December 10, 2012. ^ a b Ricky Maranon (April 7, 2010). "Bill adds OKC bombing to education curriculum". The Oklahoma Daily. Retrieved December 10, 2012. ^ Manjoo, Farhad (August 26, 2006). "Cityscape of fear". Salon. Archived from the original on March 18, 2011. ^ Hill, John (2004). "Changing Place/Changing Times". Invisible Insurrection. Archived from the original on March 18, 2011. ^ Duffy, Daintry (December 9, 2003). "Hidden Strengths". CIO Magazine. Archived from the original on March 18, 2011. ^ "Safeguarding Building Perimeters For Bomb Attacks". Security Management Consulting. Archived from the original on March 18, 2011. ^ Dixon, David (October 2002). "Is Density Dangerous? The Architects' Obligations After the Towers Fell" (PDF). Perspectives on Preparedness. Retrieved June 5, 2009. ^ Nadel, Barbara A. (March 25, 2002). "High-risk Buildings Placed in a Class All Their Own". Engineering News-Record. Archived from the original on March 18, 2011. ^ Markon, Jerry (October 25, 2006). "FBI's Fairfax Agents Packing For Pr. William". The Washington Post. Archived from the original on March 18, 2011. ^ Linenthal, Edward (2003). The Unfinished Bombing: Oklahoma City in American Memory. p. 29. ISBN 978-0-19-516107-6. ^ Hamm, Mark S (1997). Apocalypse in Oklahoma. p. 41. ISBN 978-1-55553-300-7. ^ WBDG Safe Committee (October 31, 2008). "Security for Building Occupants and Assets". Whole Building Design Guide. Archived from the original on March 18, 2011. ^ WBDG Safe Committee (June 28, 1995). "Justice Department Issues Recommendations For Upgrading Federal Building Security". United States Department of Justice. Archived from the original on March 18, 2011. ^ Nadel, Barbara A. (April 2007). "Oklahoma City: Security Civics Lessons". 2 (4). Buildings.com. Archived from the original on December 15, 2007. Retrieved June 5, 2009. ^ Nadel, Barbara A. "Designing for Security". Architectural Record. ^ "The Bomb in Oklahoma City (Oklahoma City)". Seconds From Disaster. Season 1. Episode episode 3. July 20, 2004. National Geographic Channel. ^ Michel, Lou; Dan Herbeck (2001). American Terrorist. Scientific American. 284. pp. 378–383. Bibcode: 2001SciAm.284f..28D. doi: 10.1038/scientificamerican0601-28. ISBN 978-0-06-039407-3. ^ a b Crothers, Lane (2003). Rage on the Right. pp. 135–136. ISBN 978-0-7425-2547-4. ^ a b Hamm, Mark S (1997). Apocalypse in Oklahoma. p. 219. ISBN 978-1-55553-300-7. ^ "news footage from Oklahoma bombing". October 20, 2007. Retrieved May 11, 2016 – via YouTube. ^ Stickney, Brandon M (1996). All-American Monster. p. 265. ISBN 978-1-57392-088-9. ^ a b Knight, Peter. Conspiracy Theories in American History. pp. 554–555. ISBN 978-1-57607-812-9. ^ Sturken, Marita (November 2007). Tourists of History. p. 159. ISBN 978-0-8223-4122-2. ^ Berger, J.M. "Did Nichols and Yousef meet?". Intelwire.com. Archived from the original on March 18, 2011. ^ Rohrabacher, Dana; Phaedra Dugan. "The Oklahoma City Bombing: Was There A Foreign Connection?" (PDF). Oversight and Investigations Subcommittee of the House International Relations Committee. Archived from the original (PDF) on March 24, 2009. Retrieved March 25, 2009. ^ "Call to reopen Oklahoma bomb case". BBC News. March 2, 2007. Archived from the original on March 18, 2011. ^ "Managing Pedestrians During Evacuation of Metropolitan Areas – Introduction". dot.gov. 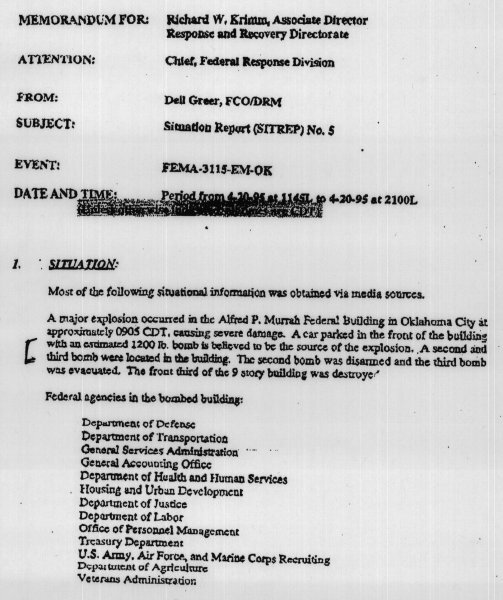 ^ "The Oklahoma Department of Civil Emergency Management – After Action Report – Alfred P. Murrah Federal Building Bombing – 19 April 1995 in Oklahoma City, Oklahoma" (PDF). ^ "Lessons We Don't Learn: A Study of the Lessons of Disasters, Why We Repeat Them, and How We Can Learn Them". hsaj.org. July 2006. ^ Sturken, Marita (November 2007). Tourists of History. p. 105. ISBN 978-0-8223-4122-2. ^ a b c Yardley, Jim (June 11, 2001). "Uneasily, Oklahoma City Welcomes Tourists". The New York Times. Archived from the original on March 18, 2011. ^ Linenthal, Edward (2003). The Unfinished Bombing: Oklahoma City in American Memory. p. 119. ISBN 978-0-19-516107-6. ^ a b "About the Designers". Oklahoma City National Memorial. Archived from the original on March 18, 2011. ^ Sturken, Marita (November 2007). Tourists of History. p. 109. ISBN 978-0-8223-4122-2. ^ McLeod, Michael (June 1, 2007). "Hundreds still live with scars of Oklahoma City bombing every day". The Orlando Sentinel. Archived from the original on March 18, 2011. ^ "Oklahoma City National Memorial". National Park Service. Archived from the original on March 18, 2011. ^ White, Zachary. The Search For Redemption Following the Oklahoma City Bombing: Amending the Boundaries Between Public and Private Grief (San Diego: San Diego State University, 1998): 70. ^ Oklahoma Historical Society. "Oklahoma City". Oklahoma State University–Stillwater. Archived from the original on March 18, 2011. ^ Koetting, Thomas B. (April 16, 1996). "Compelled, They Come: Visitors To The Blast Site – Oklahoma City/One Year Later". The Seattle Times. Archived from the original on March 18, 2011. ^ "'And Jesus Wept' Statue Vandalized". KOCO-TV. November 14, 2003. Archived from the original on March 18, 2011. ^ Harper, Justin; Matt Patterson; Jason Kersey (April 30, 2007). "2007 Oklahoma City Memorial Marathon: Notebook". The Oklahoman. Archived from the original (Fee required) on March 18, 2011. ^ "AFGE Commemorates Oklahoma City Bombing" (Press release). AFGE. April 6, 2005. Archived from the original on March 18, 2011. ^ Kurt, Kelly. "Children's pain – Victims speak on bombing anniversary". The Portsmouth Herald. Archived from the original on March 18, 2011. ^ a b "Vice President's Remarks at Day of Remembrance Ceremony" (Press release). White House. April 19, 2005. Archived from the original on March 18, 2011. ^ "Oklahoma City Marks Bombing Anniversary". CNN. April 19, 2005. Archived from the original on March 18, 2011. 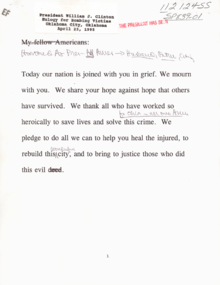 ^ "President's Statement on Tenth Anniversary of Oklahoma City Bombing" (Press release). White House. April 19, 2005. Archived from the original on March 18, 2011. City of Oklahoma City Document Management (1996). 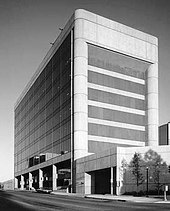 Final Report: Alfred P. Murrah Federal Building Bombing April 19, 1995. Stillwater, OK: Department of Central Services Central Printing Division. ISBN 978-0-87939-130-0. Crothers, Lane (2003). Rage on the Right: The American Militia Movement from Ruby Ridge to Homeland Security. Lanham, MD: Rowman & Littlefield. ISBN 978-0-7425-2546-7. Figley, Charles R. (2002). Treating Compassion Fatigue. New York: Brunner-Routledge. ISBN 978-1-58391-053-5. Giordano, Geraldine (2003). The Oklahoma City Bombing. New York: The Rosen Publishing Group, Inc. ISBN 978-0-8239-3655-7. Hamm, Mark S. (1997). Apocalypse in Oklahoma: Waco and Ruby Ridge Revenged. Boston: Northeastern University Press. ISBN 978-1-55553-300-7. Hamm, Mark S. (2002). In Bad Company: America's Terrorist Underground. Boston: Northeastern University Press. ISBN 978-1-55553-492-9. Hewitt, Christopher (2003). Understanding Terrorism in America: From the Klan to Al Qaeda. London; New York: Routledge. ISBN 978-0-415-27765-5. Hinman, Eve E.; Hammond, David J. (1997). Lessons from the Oklahoma City Bombing: Defensive Design Techniques. New York. ASCE Press. ISBN 978-0-7844-0217-7. Hoffman, David (1998). The Oklahoma City Bombing and the Politics of Terror. Feral House. ISBN 978-0-922915-49-1. Irving, Clive, ed. (1995). In Their Name. New York: Random House. ISBN 978-0-679-44825-9. Jones, Stephen; Israel, Peter (2001). Others Unknown: The Oklahoma City Bombing Conspiracy. New York: PublicAffairs. ISBN 978-1-58648-098-1. Kellner, Douglas (2007). Guys and Guns Amok: Domestic Terrorism and School Shootings from the Oklahoma City Bombing to the Virginia Tech Massacre. Boulder, CO: Paradigm Publishers. ISBN 978-1-59451-492-0. Knight, Peter (2003). Conspiracy Theories in American History: An Encyclopedia. Santa Barbara, CA: ABC-CLIO. ISBN 978-1-57607-812-9. Linenthal, Edward (2001). The Unfinished Bombing: Oklahoma City in American Memory. New York: Oxford University Press. ISBN 978-0-19-513672-2. Michel, Lou; Dan Herbeck (2001). American Terrorist: Timothy McVeigh & The Oklahoma City Bombing. New York: ReganBooks. ISBN 978-0-06-039407-3. Miller, Richard Earl (2005). Writing at the End of the World. New York: University of Pittsburgh Press. ISBN 978-0-8229-5886-4. Oklahoma Today (2005). 9:02 am, April 19, 1995: The Official Record of the Oklahoma City Bombing. Oklahoma City: Oklahoma Today. ISBN 978-0-8061-9957-3. Sanders, Kathy (2005). After Oklahoma City: A Grieving Grandmother Uncovers Shocking Truths about the bombing ... and Herself. Arlington, TX: Master Strategies. ISBN 978-0-976648-50-5. Serano, Richard A. (1998). One of Ours: Timothy McVeigh and the Oklahoma City Bombing. New York: W. W. Norton & Company. ISBN 978-0-393-02743-3. Sherrow, Victoria (1998). The Oklahoma City Bombing: Terror in the Heartland. Springfield, N.J.: Enslow Publishers. ISBN 978-0-7660-1061-1. Stickney, Brandon M. (1996). All-American Monster: The Unauthorized Biography of Timothy McVeigh. Amherst, NY: Prometheus Books. ISBN 978-1-57392-088-9. Sturken, Marita (2007). Tourists of History: Memory, Kitsch, and Consumerism from Oklahoma City to Ground Zero. Durham, NC: Duke University Press. ISBN 978-0-8223-4103-1. Wright, Stuart A. (2007). Patriots, Politics, and the Oklahoma City Bombing. Cambridge; New York: Cambridge University Press. ISBN 978-0-521-87264-5. Key, Charles, State Representative (2001). The Final Report of the Bombing of the Alfred P. Murrah Building. Oklahoma City, Oklahoma: The Oklahoma Bombing Investigation Committee. ISBN 978-0-971051-30-0. (pb). LCCN 2001277432. 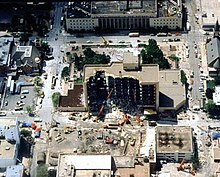 Wikimedia Commons has media related to Oklahoma City bombing. "Images of the bombing". Archived from the original on June 7, 2009. Retrieved November 11, 2008. Voices of Oklahoma interview with Stephen Jones. First person interview conducted on January 27, 2010, with Stephen Jones, attorney for Timothy McVeigh. Voices of Oklahoma interview, Chapters 14–17, with Ron Norick. First person interview conducted on July 28, 2009, with Ron Norick, mayor of Oklahoma City when the bombing took place.